I was an early adopter of video blogging and screencasting. In the last year or so, I've gotten away from it. I really miss making videos and screencasts. I have a loaner FLIP Camera for a couple of weeks. It is the camera that many nonprofits are using to tell their story because they're easy to use and inexpensive (they product giveaway program too). So, since I have a short window to play with this camera, I've been hunting for inspiration and resources to get started exploring its possibilities. 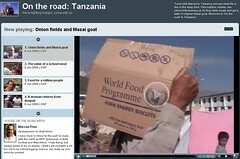 For inspiration, I had to look no further than the "On the Road: Tanzania," a video blog from the UN World Food Programme. They are using FLIP Cameras and Camtasia editing software to product a series of videos of their deep field work in Africa. The videos include a visit nutrition centres where school kids show up for their daily meals and get a taste of original Masai goat. The video bloggers Marcus Prior their spokesperson from East Africa. This is just one of the many different ways they are using social media for the fight against global hunger which has only intensified with the financial crisis. Take a quick look around their homebase Web site to easily see their creative use of social media, from bloggers campaigns to Wall Against Hunger. If your nonprofit is exploring the use of the video to tell its story, the technology has gotten so much easier and the cameras a lot less expensive. Here's a few how-to resources that relate to the camera and software that were used to create the On the Road: Tanzania video blog. The Art of YouTube: Jammed packed full of tips and best practices, Michael Hoffman's deck and resource post from NTC08 is a classic. YouTube Nonprofit Program Here's where you sign up for a Nonprofit YouTube channel if you haven't already, but be sure to check out the tip sheets. Need more inspiration for nonprofit videos? 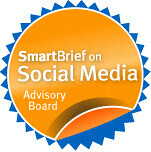 Check the blog and highlighted videos. Quick Video Guide for Nonprofits: WeAreMedia offers a very simple step-by-step guide and examples. Messagae in Box: Video: From Tactical Technology, a good step-by-step guide that covers all aspects of video storytelling for human rights activists. Now all I need to find is some additional brilliant examples of nonprofit organizations using FLIP cameras. Have an example you want to share? Leave it in the comments.